While you wait for me, I’ll bring back this old idea to write about a few meals I did not eat – in places I have eaten recently. The links are theirs; the descriptions and pictures mine. In due time, I will write full reviews of all the meals featured below – all deserve it. Two nights ago, Dominique Crenn really surprised me with an incredible meal, worthy of two Michelin stars. 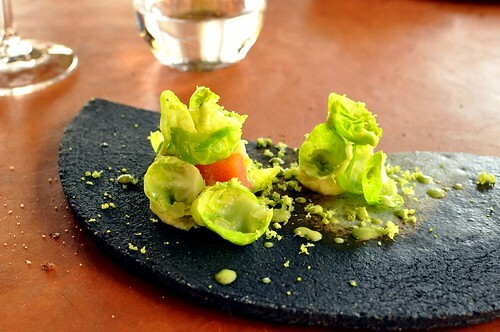 Her food at Luce was stylish but it felt constrained, perhaps limitations placed on her by the hotel. 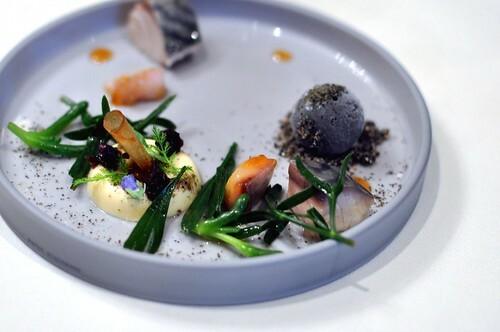 And while the food at Atelier Crenn looked more expressive, it also seemed, from pictures, overwrought; so much so, that I hesitated to visit for too long. That was a mistake. 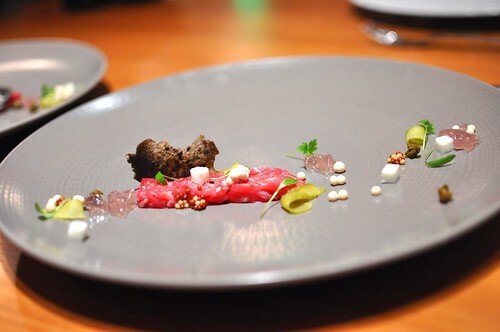 Intense, concentrated flavors; an under-stated but very effective use of texture; and a surprising use of temperature contrasts throughout the meal left the entire table smiling and happy – this is one of the best restaurants in San Francisco, if not the country. In September, the Germany National Tourist Board invited a few bloggers and journalists to eat at some of Germany’s more forward-thinking restaurants. All of the meals were bound by the German penchant for exactness but La Vie, recently awarded its third star, had an imagination that resonated most with today’s modern cooking. Thomas Bühner’s food was intricate but effortless, with many interesting combinations on his plated landscapes. However it was a seemingly straight-forward venison dish, “Pure Venison”, that was a masterpiece – the concentrated essence of deer. Dan Hunter came to California for a special guest dinner at Manresa. 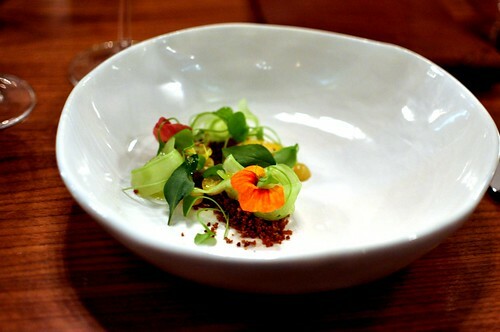 His dishes were vegetable-forward and lighter, in tune with the normal dishes at Manresa. 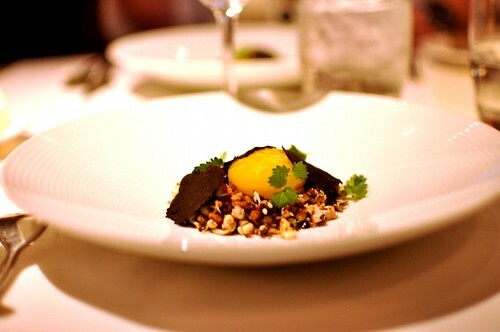 One dish in particular – egg yolk, rye, legumes, & yeast – was astounding. 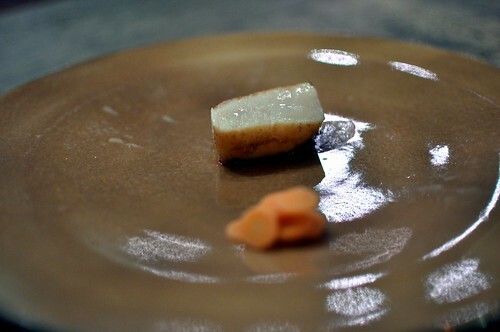 The textures and sharp flavors were very unique in a fine dining context – such simple ingredients elevated to such highs. Wild Licks beautifully captures the striking interior of this newly re-designed restaurant near the France/Belgium border, and the photos also give a hint about the food. There is a deviant streak that runs throughout the meal, from the food to the service. Conventions are challenged and pushed – this might be the most interesting restaurant I have visited this year. Sons & Daughters is a fun restaurant for San Francisco because it’s trying to be something more than Italian food. In the past, I described it as a “one-star restaurant in the making” and suggested it to friends as a relatively inexpensive menu with some fireworks. It is interesting to see two self-taught chefs tackle a project with ambition and even to experience some of the rough edges. 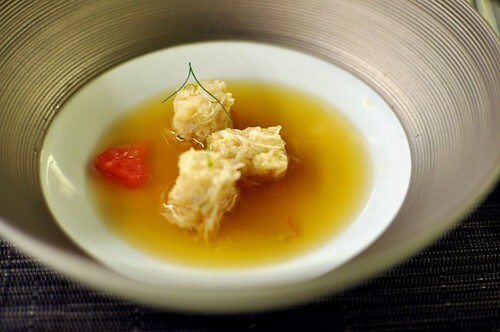 But it also keeps getting better and better – so much so that Michelin awarded it one star this past October. Paris is the greatest city in the world but the dining scene is difficult – there are the expensive gambles of l’Arpege and Pierre Gagnaire or the impossible reservations of Passage 53 or Yam’Tcha. During the German trip, Laurent from Gastros on Tour insisted that I try Agape Substance, a refreshing breath into the Paris dining scene. And before I could say yes or no, he had made a kitchen table reservation for me. The chef, David Toutain, has cooked at l’Arpege and Mugaritz so there was no question it could impress. And it did – it made dining in Paris exciting again. Interesting post, I am so glad that I have visited your site. Such a wonderful time reading this. Loved Agape, a very fun meal. I had no idea you’d linked my blog here; thanks for that.